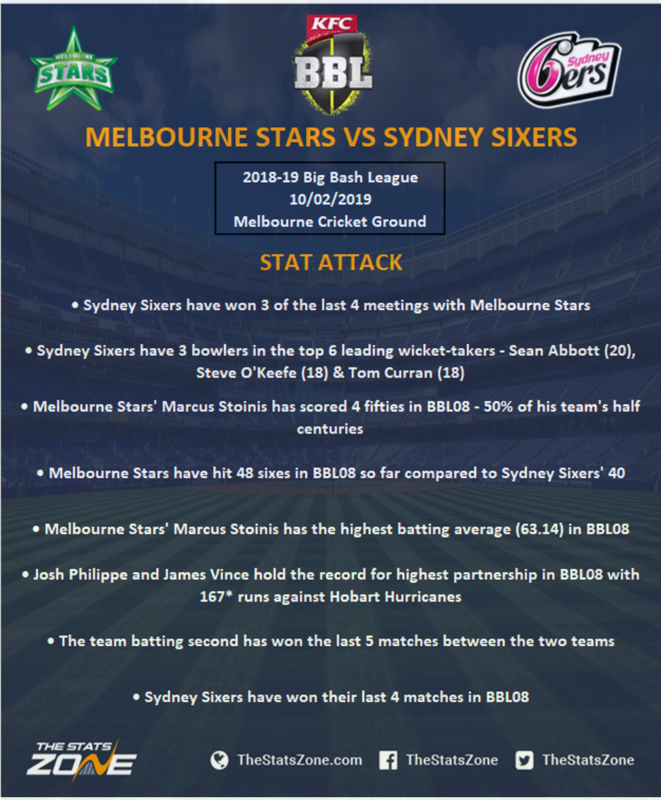 What is the expected weather for Melbourne Stars vs Sydney Sixers? Cloud expected but rain unlikely and temperatures of 22-24c. The Stars come into the final match of the group stage knowing they have to win this match to leapfrog Brisbane Heat to claim fourth place and a play-off spot so the pressure and motivation is all on them coming into this clash with the Sixers. The squad is unchanged for this match and they will be desperately hoping their bowlers can have a much bigger impact than they had against Brisbane Heat last time out as they were hammered by ten wickets as the Heat knocked off 158 in just 10 overs following a dismal bowling display. They have been relying heavily on Marcus Stoinis with the ball but certainly with the bat and they desperately need the likes of Handscombe, Maxwell, Dunk and Maddinson to contribute more if they are to reach the knockout phase. Barring a heavy defeat, the Sixers have second place comfortably in their grasps even in defeat due to their net run rate but they will want to go into the knockout phase with good momentum and they have won their last four matches in a row coming into this game. As long as the Sixers do not lose by 62 runs or by 7.4 overs, they will finish second in the group so they have some margin for error, but they will be keen to maintain their good run of form ahead of the semi-finals and ensure they earn a home game. They are boosted by the return of Nathan Lyon for this match as he has been released from international duty so that only bolsters what is already the most in-form bowling attack in the tournament. The Stars come into this game knowing a victory will see them qualify for the semi-finals but they have been in great form in recent matches. The Sixers have already qualified and even with defeat – barring a heavy one – will see them finish second and seal a home semi-final. They have form on their side here as they have won four in a row and they can play with complete freedom. That pressure on the Stars may work against them here along with their poor form, and despite them having the greater motivation, they could slip up here.